Chi Generator®, Orgonite®, Orgone Feng Shui™, and much more! Click Here to Video-Call us Online and enter our online store and show-room, where you can see and experience the Chi Generator® of your choice and find out from one of our specialists how you can use this exciting new technology to set up a very effective and powerful feng-shui energy greenhouse and how this can help you achieve manifestation of your deepest desires and positive permanent change! You can call us on Skype and we can show you the shooters such as the CEG 1000 or other generators and radionics machines - our Skype address: chi.tec - or click below! No web cam and skype? Deeply worried about "bad feng shui" in your home and/or office? There is absolutely no reason any more to worry about this! or as a wallpaper on your smartphone! most importantly, this is extremely easy to do! 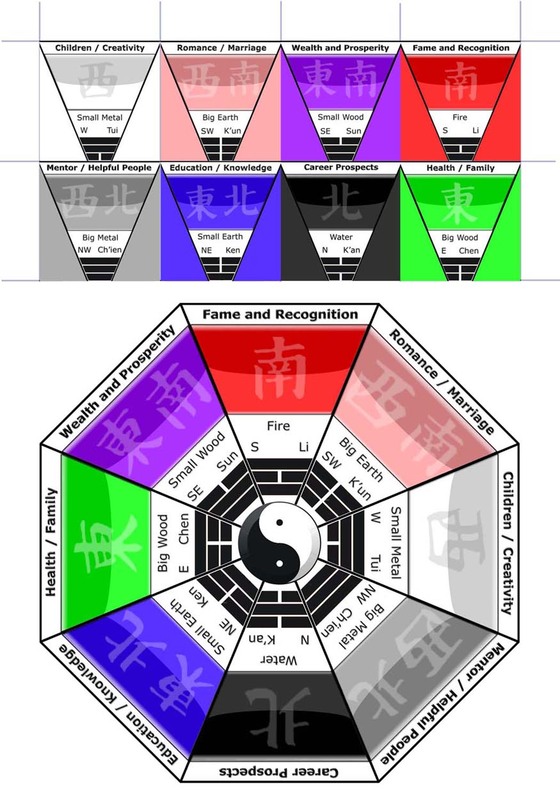 Click here to get a FREE Chi-Card®, then print out the Bagua and Feng Shui cards above, take the Feng Shui symbol you like for this test, put it on top of your Chi-Card® - put both any place in your home and start working with Feng-Shui related activities next to it. Naturally, you can also charge water and food with the Feng Shui Energy you choose! Thus truly is extreme energetic flexibility for you! or the Very Affordable Flexibility of Chi energy boosted Feng Shui. the Choice is Yours, of course !!! in other words: Got "bad Feng Shui?" ... and then some very good advice from an "expert"
a suggestion and additional "good advice"
even re-build your home or office? In fact, as you know by now, especially after the test, to get the Feng Shui of your choice wherever you want it to be active is a lot easier than most of the feng shui experts think - in fact, most of them even think that this is not possible! Most, importantly, by now you can save yourself a lot of money, in addition to gaining a flexibility that was unheard-of in traditional and now antiquated approaches to Feng Shui, and you can do this with the help of this exciting new technology: a technology of which most traditionalist experts and "popes" of Feng shui sure wish it would disappear! of your choice into whichever sector of your house you prefer it to be active. makes you independent of any local Feng Shui energies. You can gain proof of this exciting new technology right now! and you can do this at any distance! print out the symbols of the feng shui corners above! Put on free transfer card! Questions? Call us at +1 770 783 0563 !! UK: + 44 7811110368 ! to promote this method and make good money doing so! To find out how you can do this, click here and email us !! A Gigantic Step into the Future - Life Force (Chi Energy) and Feng Shui !!! Wilhelm Reich and Franz Anton Mesmer 150 years before Reich invented the orgone accumulator, which is a device that accumulated life force, Orgone energy, or Chi energy, from its surroundings. In 1991 Karl Hans Welz invented the Chi Generator®, wich is a device that actually generates life force, or Chi energy. At the same time, he also established scientific proof that Chi Energy transfers at any distance via structural links, i.e., by means of near-identical or equivalent structures. Based on the fact that Chi transfers at any distance via structural links, he developed the revolutionary new technology of Feng Shui-Plus. Consequently, Feng Shui-Plus provides you with the means to be totally independent of any feng shui energies that surround you naturally: Wherever you are, you can now receive the feng shui energy of your choice regardless of the location or feng shui "corner." You can do this by projecting the feng shui energy of your choice into that location or, better, by surrounding yourself with the feng shui energy, which you determine as being the ideal one for your purposes at that specific point in time and location. Chi Energy Technology and Chi Transfer from your Chi Generator® provides you with an entirely new approach to feng shui: Consequently, you are no longer controlled by your environment as preached by the followers of traditional Feng Shui, and gone for good are the days when you had to rearrange your home and adjust furniture, layout and living spaces to the utterly rigid (and very costly) rules of traditional feng shui. In fact, by now you can be the one who is in full control of your Feng Shui energy at any location !!! and you can get the evidence right away with the free test! Feng Shui advantages you can enjoy without the inconveniences of re-arranging or even re-building your home, office or business! In fact, by now you can optimize your building with the energies of Feng Shui wherever you want them, no matter how "impossible for good Feng Shui" that building may be according to rigid traditional thinking. All it takes are a quick reference sheet, a Chi Generator® such as the JU99, the AO 1100 or the AO 2000, a Transfer Couple and a Feng Shui Bagua Set. With this equipment, setting up the Feng Shui energy of your choice in the location of your choice will be as easy for you as 1-2-3! In fact, by now you can go much further than custom-designing the layout of Feng Shui energies in your living- and work spaces! Now you can project the Feng Shui energy of your choice to yourself any place you are, no matter in what "Feng Shui corner" you are at the time being, and you can do so at any distance from your equipment, whether a few houses away from your Feng Shui Plus™ equipment or half around the planet. The new invention of the Chi Generator® by Karl Hans Welz makes this extremely easy for you! Gone for good are the days when you had to go to a specific location just to be in the “correct” Feng Shui corner that is most suitable for your purposes, and gone for good are the days when you had to spend hundreds, if not thousands, to have some "professional " follower of traditional, by now totally obsolete, methods of Feng Shui advise you how to re-arrange, even re-build (for additional money) your business and/or your home. This expansion of your options became possible as a result of combining feng shui with the invention of the Chi Generator®. The choice which way to go is yours, of course. In fact, you can even combine two or more feng shui energies! And more: go into chitec.us - there you find explanation of how to have life force radiate from your smartphone. You simply use a transfer diagram, have this as a wallpaper and print it out and put it on to your chi generator®! This is continuous chi energy for you! and you can have the 8 feng shui corners on your smartphone, which are combined with the transfer diagram (structural link to your chi generator® and this way you can set up any feng shui energy you choose - and you can enjoy this energy anywhere! In fact, now you can perform the free chi transfer test into your office or as a wallpaper of your smartphone which has the fengshui energy of your choice, and you can do this before you decide to change the overall energy in your home or office! All it takes to click here and to follow the instructions! Most importantly, there is absolutely no risk involved, financial and otherwise, and it's for free! This is truly a big difference to costly "expert" consultations on how to remodel your home! Yes !!! Powerful Chi energy that is generated by your Chi Generator® makes it possible for you by now to project the Feng Shui direction of your choice to any place and to any person of your choice, including yourself! In fact, with this extraordinary new technology, you can now make use of Feng Shui energies in ways that the traditional Feng Sui consultants did not even dare to dream about. Those are methods that very likely many of the "traditionalists" are going to reject, because such methods go way beyond their rather tradition-rooted, i.e. 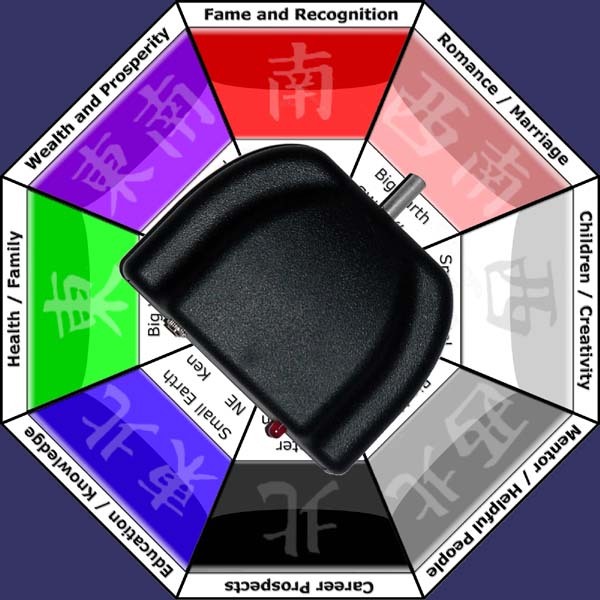 rigid, ways of thinking: With this advanced equipment, you can now custom design Feng Shui energies of your choice by combining two or more of the Feng Shui corners. In addition to this, you can have the same direction in more than one location of the same room or apartment. Such phantastic potential simply does not exist in traditional Feng Shui! Most importantly, you do not even need to know the intricacies of traditional Feng Shui to enjoy the full benefit of this extremely powerful and versatile technology. All you need to know are the properties of the eight Feng Shui corners, which you can simply read off the Feng Shui Bagua that you will receive with the manual for your equipment, and setting up the energies of your choicce, or a combination of energies of your choice whenever you are using this advanced equipment, will be as easy for you as child´s play! By now, the choice, which way to go, is yours, of course. In fact, with this extremely easy and much more flexible new technology of Feng Shui-Plus available to you, there is absolutely no need any more for anybody to go to costly weekend seminars, there is no need at all for any person in his or her right mind to have even costlier "Feng Shui specialists" tell them how to do still more expensive re-arranging or even extremely expensive re-building of their home or business. In the example below you can see just how easy it is for you to set up the Feng Shui energy of the South West for Love and Romance for yourself or set feng shui energy for a specific location so that you can gain the full benefit of this exciting new technology! 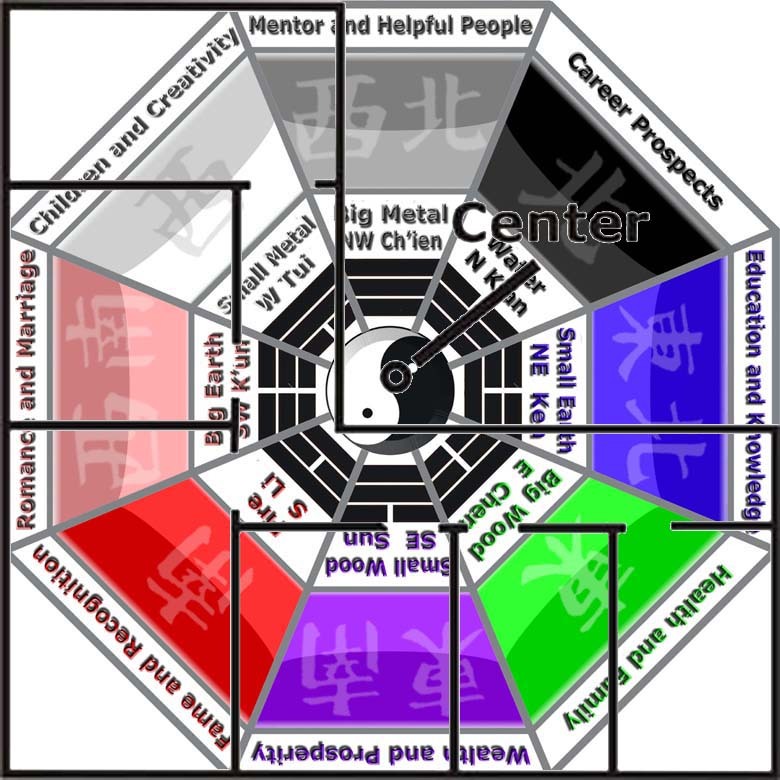 To energize a room or location: Put the bagua into the desired location, then put the AO 1100 onto the Bagua, pointing in the direction whose energy you want - see above. It is important to set up the bagua in such a way that the North direction of the Bagua actually is pointing towards North. Use a compass, if you are not quite sure where exactly the Northern direction is. To energize yourself with a specific Feng Shui energy, no matter where you are: Location of the Bagua with Chi Generator© is irrelevant. Have the Chi Generator point in the desired direction. Then you put one part of your transfer couple onto the sector on the Bagua where the JU 99 is pointing and you carry the other part with you. This ensures the Chi transfer of the desired Feng Shui energy to you wherever you are, regardless of local Feng Shui energies. Moreover, in addition to enjoying the full benefit of the Feng Shui corner of your choice, you will now also be super-energized by the Chi that is your equipment is generating. The free feng shui transfer test will prove this exciting potential of your new equipment beyond the shadow of any doubt. It is proof that you can transfer the Feng Shui energy of your choice anywhere, into the next room or half around the globe. More Flexibility and More Options with the AO 2000! The AO 2000 (left) is more powerful than the AO 1100 and it offers you more options, and moreover, the AO 2000 is a water optimizer as well. For instance, by putting water or food onto the transfer plate of the RAOPTC Power Transfer Couple for Aqua Optimizers, you can charge this water, drink, food or supplement with the Feng Shui energy of your choice, no matter how far away you are from your device! 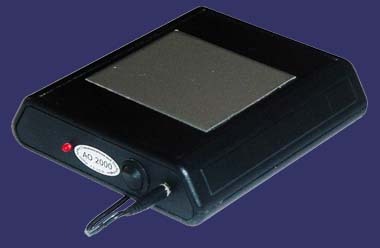 Below you see the AO 2000 with Bagua and the RAOPTC to charge water, drinks or food. In this example, the round part of the RAOPTC is in the sector that provides your food or drink with the energy of the South-East corner, i.e., with everything that has to do with Wealth and Prosperity. This means that you can energize your food and drinks towards attracting wealth and prosperity, and Feng Shui energies that you can ingest supercharge your food and drinks. Above you see a still more powerful equipment for Fengshui-Plus: The LPOG 2400 HD, again with transfers and Bagua. 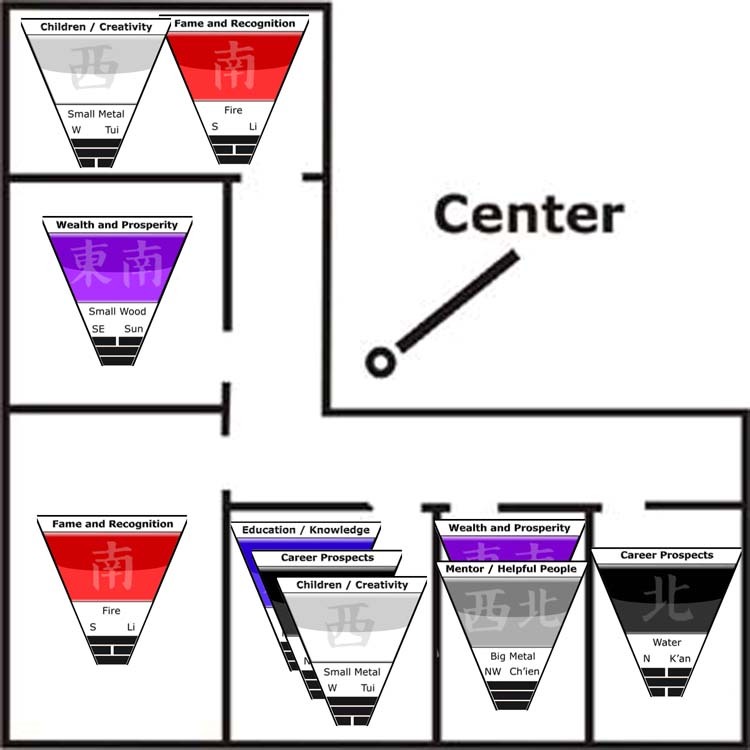 Top Left: Using the Transfer Couple TC 99 on the Bagua, point the rectangular part into the direction of "Marriage and relationships" while carrying the round disk or the TC 99 on you or energizing a room or an area in your home with this Feng Shui corner, and this will replace any energy form has been there originally. As was pointed out previously, it does not matter whether you project this energy into the neighboring room or to a location half around the globe on another continent. You can get proof of this fact by following the instructions of our feng shui energy transfer test !!! Top Right: an example of using the Power Booster with Transfer Disk. Point the booster part in the direction of your choice and again either carry the transfer disk on you or put it in the LOCATION OF YOUR CHOICE !!! is an orgone shooter with capabilities, which are ideal for any purpose. For instance, you can point it at your feng shui setup or, using a feng shui symbol on it, you can project the corresponding feng shui energy wherever you want to. Boost its power to the max, even to the extreme, with two additional Chi Generators®, each of which powers astrological energies! Then point the CEG 1000 to wherever you want these energies to be active! Click here and get additional info about this amazing new machine - You can also skype-video call us for a demo! Also great to optimize water or food at a distance with the astrological and planetary powers of your choice! 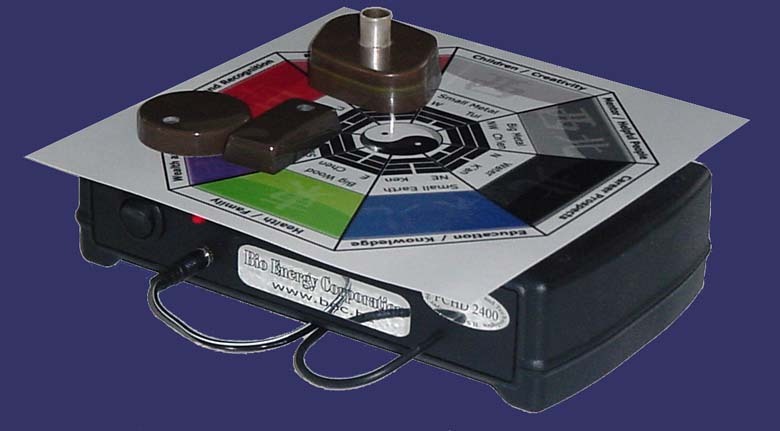 is an orgone generator® (Chi generator®), with which you can set the life force (chi energy, orgone) to precision frequencies of your choice, such as plaetary frequencies or frequencies of the signs of the zodiac. As you know, specific frequencies are also at the basis of specific modes of interaction with the environment: from somnambulistic-hypnotic states, deep meditation, all the way to persistence, stamina, precision, aggression in sports, charisma, etc. check out the frequency list in the manual, which you can find in www.akor.cc. Middle of the Line Power, works great in combination with the CEG 1000! Click here and get additional info about this amazing new machine - You can also video call us for a demo! The JU 1000 provides life energy for your body and for your mind -- Above all, you can put yourself into any brain wave state by selecting a specific pulse frequency of your life energy generator. When the rotary switch is turned all the way to the right, you can use the right dial for continuous settings. Click here and get additional info about this amazing Six-position machine - You can also video call us for a demo! is a Middle of the Line Chi Generator®, with beamer plate, silver tubing output, transfer couple TC 99, built-in voltage regulator for precision of the frequencies, ready to use. The LPOG 2400 DL has 6 low pulse frequencies, plus the option of continuous settings (see above the JU 1000). More than double the power of the JU 1000. Increase its power significantly with the PBT 2400 Power Booster with Transfer Disk. Click here and get additional info about this amazing six-frequency machine - You can also video call us for a demo! Top of the Line Orgone (Chi) Generator®, beamer plate, silver tubing output, stick pad, transfer couple TC 99, built-in voltage regulator, ready to use. The LPOG 2400 DL has 6 low pulse frequencies, plus the option of continuous settings. More than three times the power of the LPOG 2400 DL. Add to its power with the PBT 2400 Power Booster with Transfer Disk. and/or by adding exterior frequencies by way of the "input EPU" jack. Click here and get additional info about this extra powerful chi boosted machine - You can also video call us for a demo! An HD orgone generator®, affirmations and precision frequencies of your choice and a great selection of 12 pre-set frequencies for performance - It is Super Heavy Duty, therefore great for multiple feng shui and other operations! Click here and get additional info about this extra powerful machine to boost performance on all levels - You can also video call us for a demo! 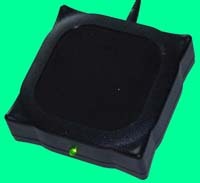 Very popular top of the line orgone generator®. You can combine astrology with corresponding precision frequencies on five positions, which are ideal for very effective work: Basic action, trend, trend in the environment, target and alternate target. Great for complex operations as well as protection - and all simultaneously. Combine Feng shui with other methods of action at a distance. Click here and get additional info about the RAD 5 and its use for very powerful work on all levels - You can also video call us for a demo! Top of the line Device with 12 orgone generators® in the ring, ideal to set up any astrological trend energy that you desire. This is the top of the line "astrological greenhouse" in which astrological settings help decisively in achieving the desired outcome of your operations. Also great for complex work on multiple targets as well as protection - and all this you can do simultaneously. Great for strong feng shui operations! Click here and get additional info about the ATG 12 and its use for very powerful astrological work on all levels - You can also video call us for a demo! Whenever you want to make water charged with life force and feng shui energies, then the AO 2000 is the ideal machine for this! Moreover, you can produce drinking water for protection and to ward off negativity. Earth Frequency of 7.83 Hz. Naturally you can charge this water with astrological trend energies. Click here and get additional info about the AO 2000 and its use for optimization of water - You can also video call us for a demo! Not quite as powerful as the AO 2000, with floating frequency, and you can use it the same way as the AO 2000. Great starter device and like the AO 2000 the AO 1100 too can be used universally. Click here and get additional info about the AO 1100 and its use for optimization of water - You can also video call us for a demo! ...Then Feng Shui Plus Manifestation is right for you! In fact, by now you can gain the benefits of the near-infinite potential of advanced feng shui - and you certainly can set up Your Personal "Feng Shui Greenhouse!" In other words, you are no longer dependent on the whims of so-called "bad feng shui." This is so, because by now you can define your own climate of feng shui energies, and you can do so with ease at all times and whichever location you like this feng shui energy - chosen by you - should be active! Moreover, you can carry this energy with you - wherever you are! 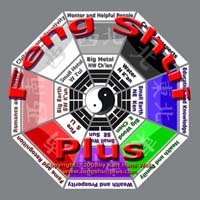 In fact, it is obvious by now that with Feng Shui Plus Manifestation you certainly can take your destiny into the best possible hands: your own !!! Click here and get additional info about this amazing software - You can also video call us for a demo! This extraordinary software offers you the ultimate flexibility! In fact, its unique design allows you to emulate any manifestation program on the market, be it, feng shui, radionic, miracle, spiritual, magical, etc. Therefore, the Super Manifestation™ Program is exciting new technology that is specifically designed for you so that you have the most powerful and versatile tool to achieve TOTAL SUCCESS !!! In fact, this extraordinary and powerful technology of manifestation upon which you are about to embark was the result of a thorough understanding of ancient knowledge in the light of modern science. This ancient knowledge can now be explained with ease in the light of the new science of orgone physics, or the physics of life force: By now we know that actions at a distance resulting in influences upon nature and human beings, or trends of destiny, are the result of the properties of life force: namely of negative entropy (reversed entropy) and direct transfer at any distance. Click here and get additional info about this extremely versatile software and its use for feng shui related work - You can also video call us for a demo! Using life energy for manifestation purposes is an advanced method of this technology. This extremely versatile new method evolved as a result of the capability to "solidify" the structural connections that you can establish with your inherent powers of abstraction, and it is exactly this capability to solidify the abstractions of your desires, which helps you achieve positive permanent solutions and change. This means that you can harness continuous power driving towards the results that you programmed into your computer. 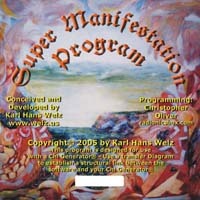 This continuous flow of life energy is made possible with a special structural link that connects your Chi Generator®, the Manifestation Program™ and the target of your operation: To make this possible, each program comes with a fully individualized transfer card and the corresponding file on your program that connect your life energy generator directly with the functions in your manifestation program™. 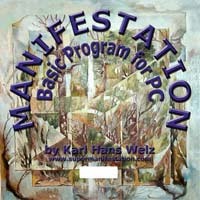 Click here and get additional info about the Basic Manifestation Program and its use for feng shui setups - You can also video call us for a demo! Below: In this example, the tremendous advantages that you can get when using the advanced AO-system are obvious! Here you can see two transfer disks in the same corner of "Wealth and Prosperity." You can put the two transfers into the areas of your choice, no matter what the Feng Shui energy would be according to traditional thinking. This truly revolutionnary method is way ahead of the traditional methods of adjusting to the existing "climate" of Feng Shui energies in your home. In fact, this advanced method compares to using technology for the purpose of making a location suitable for one´s needs such as putting heating and air-conditioning into your home and using this technology to regulate the temperature there as you wish, which, according to "traditional thinking" would not exist there. Performing this feng shui test will give you this exciting practical experience and much more! Summary: A scientific approach to Chi energy at last! 3. Transferring to other places via structural links, Life Force carries with it characteristics - often "trend energies" - of its original position. This is a characteristic of Chi energy, which is similar to EMF transfer, where, for instance light is reflected in specific colors, shapes, etc., before reaching the eye of the observer. 4. This characteristic is an explanation of "remote viewing" and other perceptions at a distance. In fact, it is a characteristic of all living beings and it can be regarded as a fundamental characteristic of life itself. 5. Conscious remote viewing and other perceptions at a distance are a result of a conscious focus of a living being to a distant object, which establishes a structural link - structural connection - with that object or set of objects. To actually gain a meaning of these perceptions and to consciously relate them to other conscous perceptions, a linkage has to be determined between the abstractions gained from remote perceptions and abstractions coming from other sensory organs and, especially, with the capability of conscious thinking, i.e. the capability of relating these sets of abstractions to each other and give them "meaning." Without that, remote viewing will remain to be "hunches" at best. This semantic connection has to be established by training, especially by persons from which the conscious relating of such perceptions/abstractions to their conscious perception of thoughts has been "educated out" as a result of misdirected religious or other socio-economic interests. Some persons have to use "genetic materials" and similar materials to establish such linkage. For others a mental focus is sufficient. A massive amount of methods to connect has been established throughout the tens of thousands of years of human existence. 6. There is much reason to assume that such connections can reach as well into the time dimensions. Presently, relying on evidence of how human brains are organizing their perceptions into time, we can speak of time as being mathematically represented by a four dimensional Gaussian space (time-lines, time-planes, ...). This mathematical-semantic structure, or mapping, possibly can account for some of the grave errors of "psychics" when their predictions of the future "do not come true." (Of course this does not account for the type of "predictions" that are not what the people making them claim them to be, but if those are simply statements that are plainly dominated by financial rewards that can be gained from misinformation that the public loves to learn about.) Functionally identical with this mathematical-semantic uncertainly is the fact that with any present act we impact the realities that we as humans perceive as future as well as past. 7. You can use the same methods of connection with specific targets not only for receiving characteristics of the target, but also to actively project characteristics of your location - or, when double-targeting, any other location of your choice, thus influencing the environment of the targeted area/living being. Again, you are using structural links and with the same methods you establish linkage to specific characteristics / properties. This is the functional basis of action at a distance as we know it and which humans have practiced throughout the course of their history under the name of miracles, magic, shamanism, out-of-body projection, etc. Copyright© 1993, 2018 by Karl Hans Welz. This natural law is at the basis of our new Feng-Shui Technology !!! Feng Shui Catalog Free Feng Shui Energy Transfer Test: Now you can set up the Feng shui Energy of Your Choice anywhere in your home or office, and that at any distance! into the best possible hands, which naturally are your own! desires into reality. Click Here for additional info and Broadcast Schedules. The Feng Shui Energy of your Choice for FREE! Select the card of your choice below - it will be emailed to you! or put it to a place where you like this specific Feng Shui energy to be active !!! 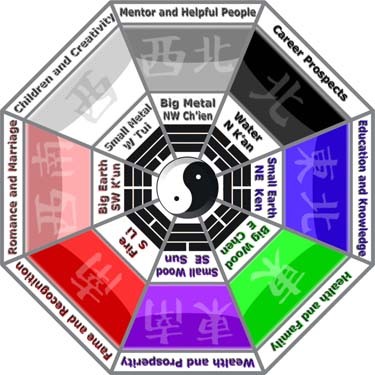 © All Concepts of Feng Shui - Plus as shown on this web site are copyrighted by Karl Hans Welz.